The Sony Xperia neo L is a decent phone (though the build quality fails to impress ) that showed up late to the party. It's clearly an old design from the Sony Ericsson era - and those phones were a bit behind the times to begin with. The biggest weapons that the neo L has in its arsenal are its screen and OS - 4" WVGA and Android 4.0 Ice Cream Sandwich are a pretty good combo, plus there's a decent still camera, good web browsing and expandable memory. So, it's a phone that can do a good job for many. It takes plenty of friendly fire though - we only managed to find it at a price (€210) that's higher of the newer, dual-core Sony Xperia U (€205). Be warned though - the U has a smaller screen (3.5"), older OS (Gingerbread, to be updated) and limited, non-expandable storage (4GB user accessible). For a bit more cash (240 euro), you can get a dual-core Sony Xperia sola with a 3.7" screen (with floating touch technology) and a microSD slot. 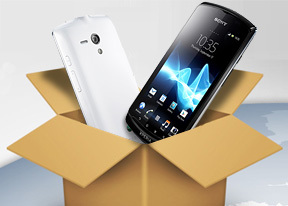 An Xperia neo V (€190) will give you pretty much the same specs as the neo L (ICS included) with a cherry on top - a microHDMI port and a hardware camera shutter key. Its only downside is the smaller screen (3.7"), though you'll be paying less for it, so it's a reasonable tradeoff. Then there's the Samsung Galaxy Ace 2 - it offers a dual-core CPU (at 800MHz), a 3.8" WVGA screen and an SD card slot. Just like the Xperia U, however, it's still on Gingerbread. The LG Optimus L7 does run ICS and has similar specs to the neo L, though it can't shoot 720p video. The older, Optimus Black can and has a bright display (700 nits), but its ICS future is uncertain. An ICS-running Optimus L5 is cheaper than both, but that HVGA resolution is stretched too thin across the 4" diagonal (we did say the high-res screen is one of the neo L's strong suits). There you have it - in this price range, compromises will have to be made and we're leaning in favor of the dual-cores . The OS can be updated, but the CPU inside the phone is there to stay. Also, there are rumors of an Xperia J, which has almost the exact same specs as the neo L and will make it obsolete when it gets official. While the Sony Xperia neo L does have some advantages over the competition, it faces a tough road ahead with its current pricing. Some people will be inclined to make different compromises than us, and they will probably find value in the Neo L over the NXT line or the Xperia sola, but their number is more likely than not to dwindle over the next few months.